Thousands of people have taken the chance to have a last look inside Battersea Power Station before its £8bn redevelopment. 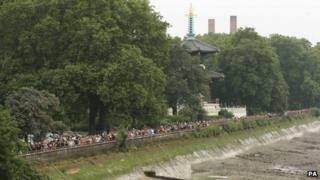 They queued for about five hours to get inside the Grade II*-listed building on the banks of the River Thames in south-west London. The structure is one of 700 venues opened up to visitors as part of Open House London weekend. The 39-acre site will be turned into 3,500 homes, offices, shops and a park. On Saturday, police helped manage the crowds as 18,000 people got into the power station. Robert Deas, 49, from Richmond in south-west London, said there had been some "ill feeling" at the point where two queues to get into the building met up. "I think it should have been anticipated that most of London would want to see inside Battersea Power Station, and I really think the whole building should have been left standing open for a week so that everyone could just wander in at their leisure." But Ross Pike, 29, said the queue had been "jovial" adding: "It's a big iconic building we've never been able to go into before. "Before it gets cordoned off and turned into apartments, I thought it would be a good opportunity to look inside it, having seen it from the street for so long." A Malaysian consortium behind the redevelopment said it will take at least 10 years to complete the project and generate 15,000 jobs. The power station building - famed for its four brick chimneys - has been vacant since being decommissioned in 1983 and features on English Heritage's At Risk register. The Open House project gives the members of the public rare access to some of the buildings. Among those also on the list are King's Cross Station clock tower, Dr Johnson's house - where he compiled his famous Dictionary of the English Language - and several embassies. Earlier the Metropolitan Police Service opened several police stations to the public.